Andy Keller is inventor and president of ChicoBag, which designs reusable bags to be compact, stylish and made from responsible materials—including recycled polyethylene terephthalate, used in plastic water bottles. Keller was in Salt Lake City at the Outdoor Retailer Summer Market and talked with City Weekly about bag monsters and why he’s being sued by plastic-bag companies. Why are plastic-bag manufacturers suing you? I talked about what’s the recycling rate on plastic bags. I was saying 1 percent. They take offense to that number and say it’s false and misleading. That number is used on hundreds of organizations’ Websites. We thought the most authoritative source was the EPA, so we sourced the EPA. The EPA took down the information a couple of years ago and only recently put up the retraction. But the recycling number that plastic-bag companies use includes pallet wrap, which totally skews the numbers. Pallet wrap is highly recyclable. No one really knows what the real number is—some plastic-bag companies say 11 percent, some say 9 percent. Why are they suing me, out of all the organizations they can sue? I think one of the main reasons is the bag-monster costume. I think I got under their skin a little bit. What people call this is a SLAP suit, a strategic lawsuit against public participation. It’s generally when a big company will sue an outspoken company or activist. They just want to shut me up. It’s not about money. They’ve sued me in South Carolina, which doesn’t have anti-SLAP legislation. The lawsuit’s in March; it’s going to be a jury trial. How did the bag monster come about? I do school fundraisers. I asked one of the schools to go find all the plastic bags in their house and bring them in. They tied it into a giant chain and strung it around the schoolyard. At the end of the rally, I got this ball of bags. So I used to carry it around and show people. One day, I got underneath it and would jump out and scare people as they were throwing away things in the trash. It was a really fun way to start a conversation. A lot of environmental messages are doom and gloom. I just want to raise awareness. Hey, we’re consuming these things, and we don’t necessarily have to. 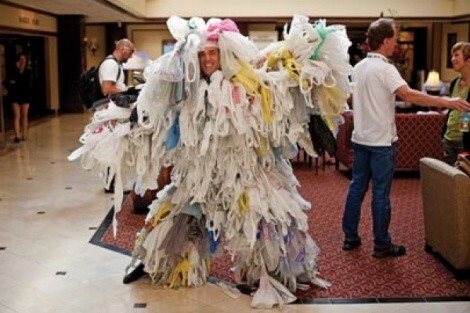 Each bag monster is 500 bags—the average number of single-use bags an American uses in one year. What’s next—any acts of plastic protest? We have these bag monsters, and we loan them out to people who are trying to raise awareness. So any organization or school who wants to borrow a bag monster and wants to use it, they can contact us and we’ll send it out. I don’t know about civil disobedience, but just use reusable bags. Don’t take single-use products. That’s a great way to protest every day. Not only single-use bags, but what about single-use coffee cups? Or bring your own water bottle. Every time you do that, even if it’s a little bit uncomfortable, it makes a statement—especially in establishments where they’re not used to it. If three or four people do that in a day, they’re gonna go, “Oh, maybe we should ask people if they need a bag.” It’s kind of a fun game, to challenge yourself, to see how many single-use products you’re using and how you can cut back. What about all the junky plastic stuff people get at trade shows like this one? We do custom bags for organizations that want a giveaway or a promotion at a trade show. It feels so good for me to do that because most trade-show items are throwaway items. Over 90 percent of promotional items are just thrown away within the first three months. The nice thing about a ChicoBag as a promotional item is that it’s actually used. How did you launch your company? In 2004, I was unemployed—I used to sell software, and I got laid off—and I didn’t really know what to do with my life. I ended up tearing apart my yard to do some landscaping, a therapeutic activity. I ended up with a lot of trash, and I brought it to the landfill. It was at the end of the day, so I basically saw what my town threw out in a single day. A lot of it was reusable, recyclable, perfectly good stuff. And what stood out to me visually were the plastic bags. There were thousands of plastic bags, and they were blowing around, caught in the tractors, caught in the fences. It kind of hit me. I used plastic bags. I never really thought about how many I used, or what they were made out of, or how long they lasted, or where they went. At that moment, I decided to kick my plastic-bag habit. On the way home, I decided, “Why don’t I use reusable bags?” I’d seen people use them, they were kind of grungy, with blueberry stains, and had this kind of hippie aura to them. And they’re really bulky. So I thought I could really kick my plastic-bag habit if I could come up with a bag that I could fit in my pocket. The unemployed side of my mind just lit up. That day, I bought a sewing machine and some fabric and started making bags. I launched ChicoBag on Earth Day in 2005. In 2007, Oprah was like, “If you want to be green, use a reusable bag!” and then the Oprah factor took effect.